Tens of thousands of violent rioters gather along Gaza-Israel border, hurl rocks and grenades. 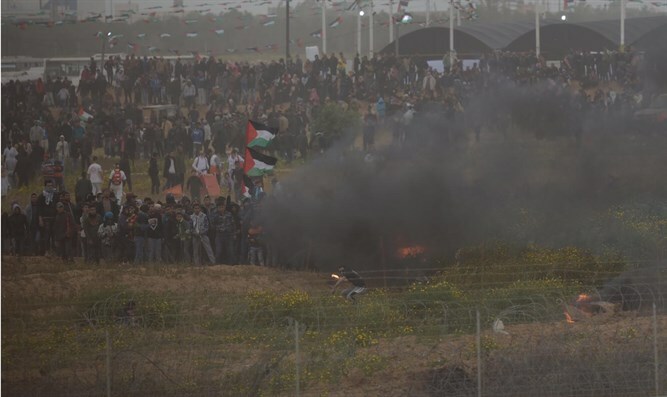 Approximately 40,000 rioters and demonstrators gathered Saturday in several locations along the Gaza security fence, the IDF reported. The rioters hurled rocks and set tires on fire. In addition, a number of grenades and explosive devices were hurled at the Gaza-Israel security fence in a number of different incidents. Most of the demonstrators are near the tents Gaza. IDF troops responded with riot dispersal means and fired in accordance with standard operating procedures. Most of the demonstrators are near the tents in the Gaza Strip.